DESCRIPTION: Use to connect disposable cylinders to preheaters, torches and other equipment with 1/4" FPT inlet. Perfect for remote preheater and torch use when space is at a premium and equipment use is minimal. 1/4 In. ID x 50', UL listed propane hose. With TWO 1/4 Inch MPT fittings. Includes a separate 1/4 FPT Coupler, #F322. Maximum working pressure 350 PSI / burst test of 1750 PSI. Price/Hose. SIEVERT #3091-33, 28 PSI PRESET LP (PROPANE/BUTANE) GAS REGULATOR, WITH DISPOSABLE CYLINDER (1LB) FITTING AND 9/16-18 LEFT HAND MPT PROPANE HOSE OUTLET FITTING. PRICE/EACH. 1/4 FNPT to 1/4 FNPT Coupling / Fitting for Gas/Propane etc. All Brass. Price/Each. MEC #ME474, Propance Adpator Fitting, 1-5/16 Inch Female ACME Inlet x 1 Inch–20 Male Outlet. Price/Each. Propane Bottle Adaptor / Fitting, Male 1-inch-20 threaded x 1/4 inch MNPT, with internal O-ring and Safety Check valve, All Brass. Adapts standard refillable cylinders to a propane hose with 1/4 FNPT fitting, or other. Price/Each. 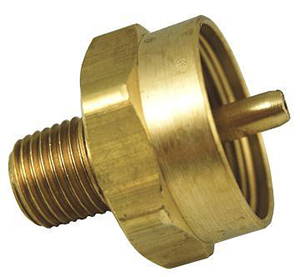 Propane Bottle Adaptor / Fitting, Male 1-inch-20 threaded x 1/4 inch FNPT, (female) with internal O-ring, NO check valve, All Brass. Price/Each.